Marketplaces and prices shown matched UPC number 887961400342 during our search. There's no job too big or too small for Happy Helpers Minnie! Happy Helper Minnie is on another worldwide adventure, and this time it's London, the land of Big Ben, tea, and crumpets. 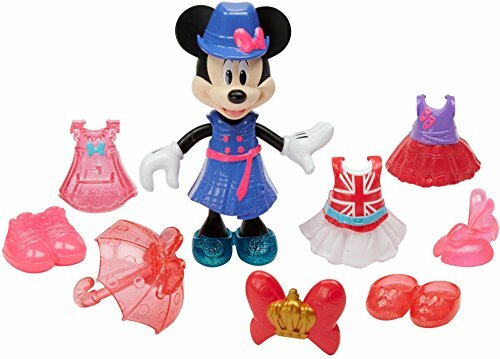 Minnie Mouse strikes a different pose with every outfit she wears with this exciting Snap 'n Pose figure and fashion set. Minnie looks absolutely smashing whether she's touring Westminster Abbey, having high tea with friends, or showing her UK pride in her Union Jack dress! But there's something special about these easy snap-on outfits. 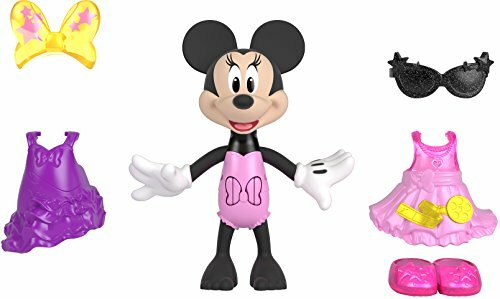 Minnie's arms and head move when the dress is snapped onto the figure. There is a unique pose for every dress. Have your child press down over and over to see Minnie repeat her special pose. This item includes four Snap 'n Pose dresses, a bow, two hats, three pairs of shoes, and an umbrella for those rainy London days and nights. 11 fashion accessories in all. There's no job too big or too small for Happy Helpers Minnie!